The Philadelphia Toboggan Company, which is known for it’s magnificent, beautifully decorated carousels, only made eight of it’s carousels for traveling carnivals out of the ninety four it built in it’s lifetime. They kept great, detailed records of who bought each one and the disposition of them over the years, right up to the company’s final carousel which was built in 1941. Some of the records are questionable though as machines were transferred in and out of their shop over the years and possibly renumbered as they were rebuilt. The articulated horse rods are an interesting feature of this machine as well as the way the horses were racked. 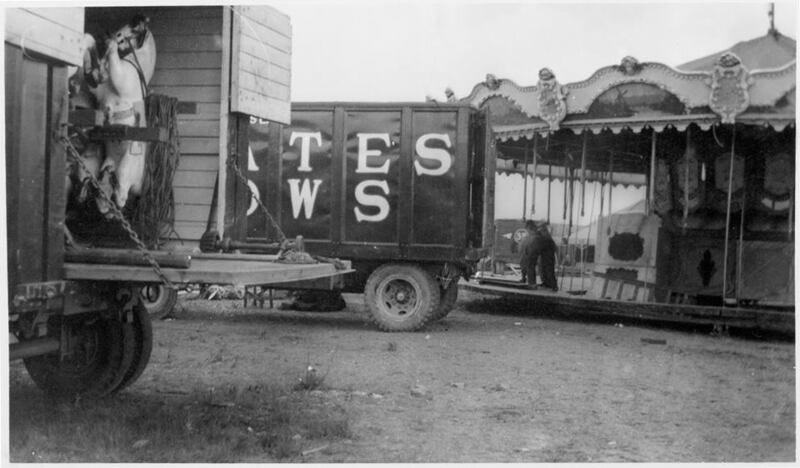 Although the center was trailer mounted, this was a big, ornate carousel and very labor intensive to set up and tear down. No. 28 was retired in 1986 and the carousel was stored for awhile. At one point the all the horses were stolen and placed for sale on E Bay where all but two were subsequently recovered. It has recently been generously donated by the Strates family to the city of Naples Florida where it’s being restored and will turn once again in 2015 to delight children for decades to come just as it did over 100 years ago.